Comping record mode. The default recording mode in SONAR is called Comping. When recording, previously recorded material on the track is not heard. When a recording is done, the newly recorded material is unmuted and all other takes are muted for the duration of the new material. Each take appears on its own Take lane, with the newest take on top. 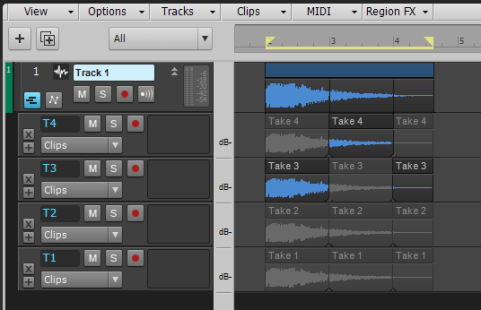 For details, see Comping record mode and Recording modes. Manual comping. 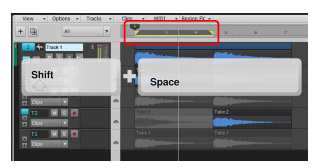 When Take lanes are visible on a track, you can use the Smart tool or Comping tool to isolate overlapping takes. 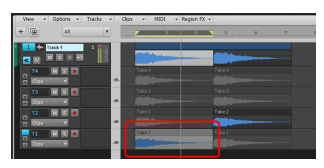 Simply click or drag across a take, and all other overlapping takes in the same track are muted. For details, see Comping with the Smart tool and Comping tool. Speed comping. After recording multiple takes, you can audition any individual take, use keyboard shortcut keys to audition other takes and then select which take you want to use. For details, see Speed comping. The default recording mode in SONAR is called Comping. When recording, previously recorded material on the track is not heard. When a recording is done, the newly recorded material is unmuted and all other takes are muted for the duration of the new material. Each take appears on its own Take lane, with the newest take on top. Go to Edit > Preferences > Project - Record, or right-click the Record button to access recording settings in the Preferences dialog box. Under Recording Mode, select Comping. 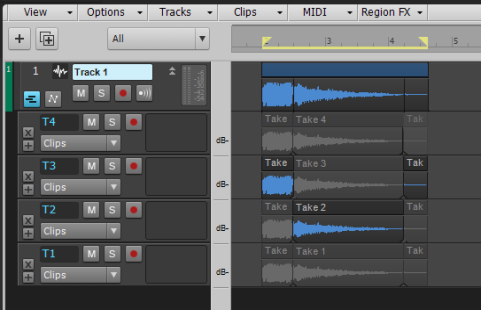 If you want to loop record multiple alternative takes, select Store Takes in a Single Track under Loop Recording. Click OK to close the Preferences dialog box. The Record button in the Control Bar’s Transport module looks like when Comping mode is enabled. Insert a new track or choose an existing track you want to record to. Click the target track’s Expand/collapse Take Lanes button so Take lanes are visible. Click the track’s Record button to arm the track for recording. Note: It is important that you arm the parent track, not an existing Take lane. Drag in the Track view Time Ruler to select the desired loop boundaries. Right-click the Time Ruler and select Set Loop Points on the pop-up menu (or press SHIFT+L). You can also click the Set Loop Points to Selection button in the Control Bar’s Loop module. Click the Record button in Control Bar’s Transport module. When recording is complete, click the Stop button . Each repetition appears in its own Take lane. Take lanes are named automatically. The first lane is named T1, the next lane is named T2, etc. The newest (chronologically youngest) take is shown on top. The lane number always stays with a lane, even if you reorder, insert or delete lanes. Figure 143. The most recent take is unmuted and on top. The following table describes how the various record modes behave when recording new takes. Hear existing material while recording? Create new Take lane for each pass when loop recording? When recording, previously recorded material on the track is not heard. When a recording is done, the newly recorded material is heard and all other takes are time-muted for the duration of the new material. The new material replaces (overwrites) any existing material. This means that portions of existing clips may be “wiped clean” to make room for newly recorded material. While recording, you will not be able to hear material from existing clips. The new material is merged with any existing material. This means that any existing clips on the track are left unchanged and all newly recorded material is stored in new clips. While recording, you will be able to hear material from existing clips. You can use any combination of looping and Auto Punch in either Comping, Overwrite, or Sound on Sound mode. Loop recording multiple takes to a single track. SONAR’s Smart tool or Comping tool have an isolate function that allows you to select a region on one Take lane and automatically mute the same region in all other Take lanes on the same track. The mouse pointer looks like when comping operations are possible. 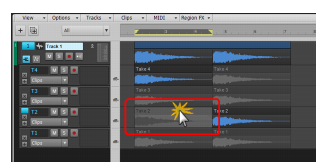 Simply click a take to isolate the take, or drag to make a time selection, and SONAR automatically mutes all other overlapping takes in the same track. Clips are split, if necessary, in order to be isolated or muted. Tip: When comping, enable Aim Assist (Edit > Aim Assist, or press X) so you can clearly see which clips overlap at the position you click. When you click or drag to isolate a take, any other takes on the same track that intersect the Aim Assist line will be muted. Figure 144. Click the take you want to isolate. When a clip is split, the two resulting clips contain identical data, but are cropped differently. SONAR will intelligently create as few clips as possible when comping. If a clip has been split, it can later be “healed” by removing the split. 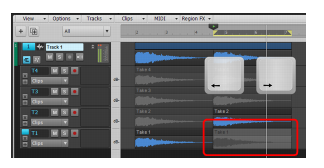 SONAR can heal split clips if two clips are abutting, and contain the identical audio data, as long as the clips have not been moved relative to each other. When you use the Smart tool or Comping tool to isolate and mute/unmute, SONAR will automatically “heal” any split clips if possible in order to reduce the number of clips. You can simply focus on identifying the regions you want to hear (isolate), and SONAR will automatically split, mute/unmute, and heal clips. Figure 145. Drag to select the region you want to isolate. Figure 146. 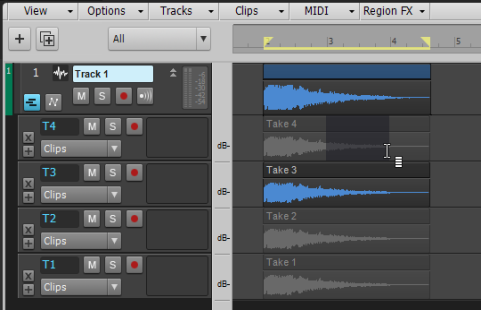 SONAR splits and mutes takes in order to define the isolate/mute regions. Figure 147. 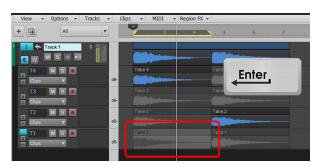 Drag to isolate another region, and SONAR automatically heals previous splits, if necessary. You can also manually heal abutting healable clips. To do so, select the clips, then hold down the CTRL key and clip one of the selected clips. Tip: You can mute/unmute individual clips if you want to have several overlapping takes unmuted. To do so, right-click and select Clip Mute/Unmute on the pop-up menu, or select the clip and press K.
Selection. 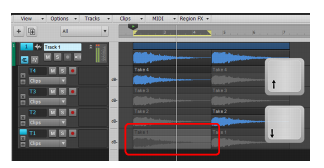 If the clicked spot is within a selection region anywhere on that track, the entire selection is isolated. Mute/Isolate regions. The boundaries of muted and unmuted regions are the zone boundaries. All mute/unmute regions across all Take lanes are used. Clips. The cropped points of the clicked clip are the zone boundaries. All comping gestures work across clips in clip selection groups, including isolating and healing. The mouse pointer shows you which edit operation is available at the current mouse position. Isolate a clip or region. Crossfade abutting clips (drag up/down). Crop abutting clips (drag left/right). Move data within clip (press ALT+SHIFT). Note: Only the Smart tool changes its functionality when editing in a Take lane. The other tools function in the exact same way as when Take lanes are hidden. The Comping tool only works when Take lanes are shown. You can quickly audition each take by itself and select only the takes you want to keep. Select a take you want to audition. Press SHIFT+SPACEBAR to start audition playback. Audition will loop continuously. You will see temporary Loop markers in the Time Ruler. Press the UP ARROW or DOWN ARROW key to audition the next or previous take. Take lanes are numbered sequentially, with the most recent take on top. When you identify your favorite take, press the ENTER key to isolate the take and mute all other overlapping takes. SONAR will automatically split and mute other takes as necessary. Press the LEFT ARROW or RIGHT ARROW key to move to other takes along the timeline. Repeat steps 3-4 until you have completed the comping. 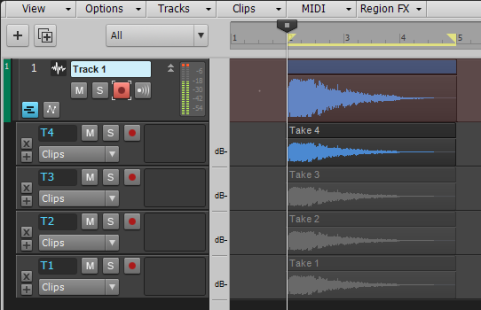 Tip: If you want to audition takes in context with other tracks, enable Dim Solo mode in the Control Bar’s Mix module. For details, see Dim Solo mode. Tip: Before speed comping, you may first want to use the Smart tool or Comping tool to drag across each musical phrase in order to split the takes into smaller phrases. This makes it easier to quickly mute/unmute shorter phrases while comping. For details, see Comping with the Smart tool and Comping tool. Also see Splitting clips, Split tool and Splitting and combining clips. The following table shows speed comping keyboard shortcuts.